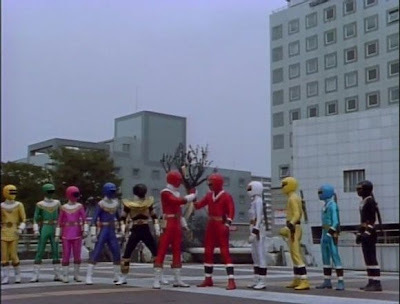 I never thought I'd put this into writing but I want to write about the Super Sentai crossover hype. If you try to do some reviews you might notice that the crossover hype wasn't done overnight. There were some stage shows then later TV performances. I want to write about the Super Sentai crossover hype which was shelved for a long time but came back during the late 90s and has been continuing until this present year of 2017. It started with JAKQ vs. Goranger which were the only two series made by Shotaro Ishinomori. The two movies were somewhat connected to each other. But what's known is that Super Sentai series didn't have any TV crossover after JAKQ ended. Battle Fever J came two years later after JAKQ. JAKQ ended early in 1977 due to slow ratings and Battle Fever J became the first year-long SUper Sentai series in 1979. From what I heard there was supposed to be a planned crossover between Sun Vulcan and Denziman but it never pushed through. It's always been the trend and I still can remember how Fantasy Leader (now Sentai Bandicoot) once told me that there's no Super Sentai timeline. It does make sense to think of a Super Sentai multiverse where almost every Super Sentai takes place in their own continuity. 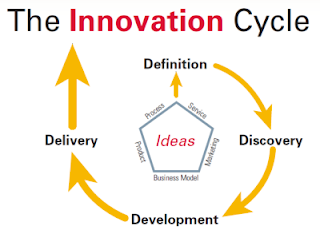 Personally, I think the multiverse format is more innovator friendly than trying to cram everything into one incredibly huge and long continuity. Most of these series are better off self-contained. For instance, Timranger says that teleportation and time travel weren't invented yet a lot of seasons before it had used some form of teleportation and time travel. I guess no matter how non-canon most of the VS Movies are but I think they're pretty popular even with the older audience. After Ohranger vs. Kakuranger there were more of these movies. They usually have events that can't be reconciled with both continuities. The thought that dinosaurs died differently in various Super Sentai seasons makes it impossible for Zyuranger, Abaranger and Kyoryuger to meet in their main continuities but possible in a huge what-if VS Movie. It can't be denied that anniversary seasons catch the crossover fever. Ohranger was the 20th Super Sentai season with Goranger and JAKQ now included in the Super Sentai series. It was also the first Super Sentai series to return the yearly Super Sentai vs. another Super Sentai type of crossover. Yet we have the anniversary seasons after that namely Gaoranger (25th), Boukenger (30th), Gokaiger (35th) and Zyuohger (40th). One way or another they couldn't be an anniversary season without a crossover. There were two anniversary seasons that had the Super Sentai season vs. Super Sentai franchise crossover. These movies are Gaoranger vs. Super Sentai and Boukenger vs. Super Sentai. Both of them had guest casts from each season. Just a note we never had Gaoranger vs. Timeranger and Boukenger vs. Magiranger as a result. 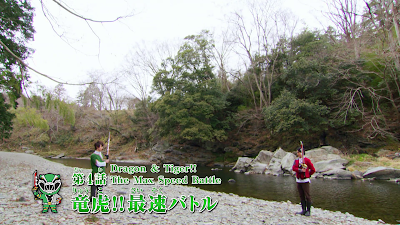 Both of these seasons featured some what could be considered as non-canon (for main continuity) crossovers while these events got carried over to Gokaiger. Then we could think of Kaizoku Sentai Gokaiger is one whole season of crossover hype. Most of the episodes show the Gokaigers meeting certain selected Super Sentai seniors before them. 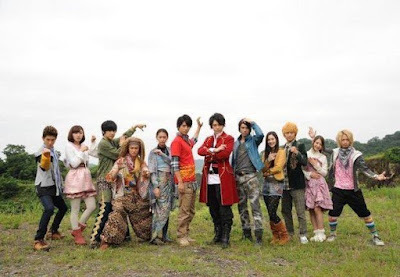 Gokaiger had the Hero 199 Movie where they had a crossover with the Goseigers. 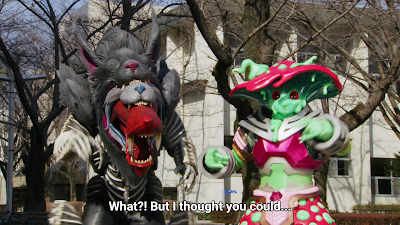 Then they ended up returning in Zyuohger for a two part crosser. How's that for a huge anniversary fever caught by Gokaiger? The idea was once in many of Toei's stage plays. The idea was somewhat loosely placed in JAKQ vs. Goranger at the end of the film. Then we had a lot of stage plays going on which weren't TV specials but I guess Toei ended up liking TV specials better. I thought about how Toei usually operates by a multiverse and there are many ways to travel into into one universe after the other. The idea itself was later placed into Super Sentai crossovers where one Super Sentai series meets a non-Super Sentai series. Lately, we have Gavan vs. Dekaranger or before that Gokaiger vs. Gavan as well as the EX-AID and Kyuranger "crossover" where both happened exclusively from the other. The first official Super Sentai vs. Kamen Rider crossover was with Shinkenger's guest role in Kamen Rider Decade. 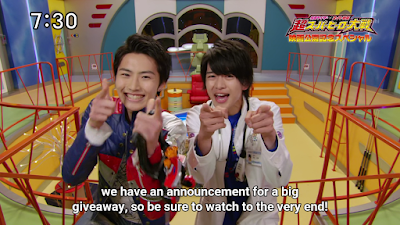 It didn't stop there as we had ToQGer vs. Gaim as a summer movie, Ninninger vs. Kamen Rider Drive, we saw a guest role for both Zyuohger and Kamen Rider Ghost which are all crossovers before we had both Lucky and Emu guest role in each others' shows. Should I mention Super Hero Taisen movies are becoming another trend? I don't deny I really hate the first Super Hero Taisen movie but I think some of the succeeding ones managed to do better. Super Hero Taisen Z was a bit of an improvement from the first movie. 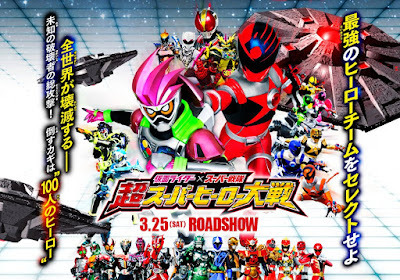 I'm still yet to see Chou Super Hero Taisen though I hope it wouldn't be a disappointment. I think that the Super Hero Taisen franchise has potential though it's better off as a video game series due to the number of characters involved. I think that continuing the crossovers with new ideas and what if scenarios would be good. They would just need proper implementation or trying other ideas. They could try and have more video games based on Super Sentai and hopefully, they'll get English versions for non-Japanese readers and speakers. What do you think of the Super Sentai crossover hype?